The most important thing about any to-do list or organiser tool is that it's simple to use. You want it everywhere you are, and you want it at the ready in seconds. It's for that reason that so many coders and geeks of all stripes have stuck to an outline file in simple text format for their organising needs. But what if your outliner was clever, and had a couple of to-do list functions? That's Workflowy in a nutshell. You can use it just as you'd use your outline text file - make a list, indent where needed, add levels and categories - whether you use the website, or the app with added touch capability. Click on + in the iOS version, and you can enter a new line or expand a level of Outline. On the web version of Workflowy, it's as straightforward as using a standard outlining tool. If you hover over an item in the web version, you can duplicate it, share it and export it - which is handy if you want to use your outliner as a time-sheet. You even get a range of handy keyboard shortcuts, from the standard tab to indent and shift-tab to outdent, to more unusual ones such as ctrl-shift-backspace to delete an item. No matter which version you use, you can always see a breadcrumb trail of the outline levels you've selected which lets you go back a level, or home, rapidly. You only ever see as much of your outline as you need to. Workflowy's to-do list functionality is basic, but functional - select an item, and you can edit, delete it or mark it complete. Want to hide all your completed items? Can do. Want to show everything you've finished today so you can send it to "I Done This" - sorted. The handiest part of Workflowy is that it makes all the things that we already do clever in simple ways. How many of us add hashtags to locate things in a file? Now you can make those filterable — just add #BigProject to everything related to your big project, and you can gather everything together, no matter where in Workflowy it's located. 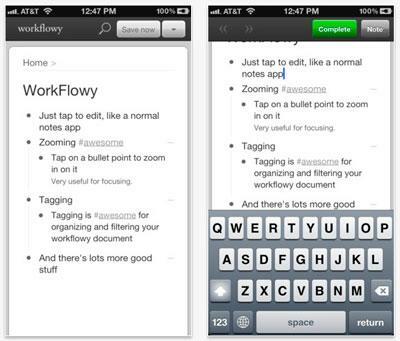 The keyboard shortcuts extend into the to-do list capabilities, too — ctrl-enter will mark something as complete. Offline functionality has just been added, and the next big item on the developers' to-do lists is dates and reminders. I've found it invaluable, and I combine work and home to-do lists together because of the easy expand/collapse and the way I can share just my "home" sub-list with my partner. We're using it for all sorts of purposes, from storing homebrew recipes to keeping track of chores. And I guess that's the beauty of Workflowy — that it's simple enough to conveniently tailor to any of the myriad uses you might have for it, while not making you learn an entirely new system. For the geek who never found a perfect to-do system, this might just be it.